WASHINGTON — House Democrats are on a collision course with Attorney General William Barr as it appears increasingly unlikely he will comply with their demands to see Robert Mueller's full, unredacted report — let alone the evidence that backs it up. At a Thursday briefing, senior House Democratic staff elaborated on the Wednesday night call between Barr and Judiciary Chairman Rep. Jerrold Nadler, D-N.Y., telling reporters that Barr refused to commit to asking a judge to release grand jury information to Congress. And the staffers emphasized that Barr all but refused to give Nadler an unredacted copy of the report. "I asked whether he could commit that the full report and unredacted full report with the underlying documents and evidence will be provided to Congress and to the American people and he wouldn't commit to that," Nadler told reporters Wednesday night. 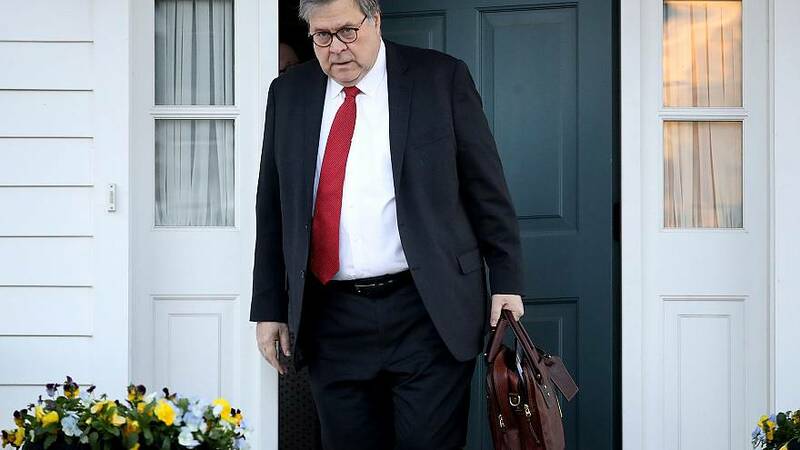 Staffers also said Barr acknowledged making a mistake by speaking extensively with the Republican chairman of the Senate Judiciary Committee, Lindsey Graham, R-S.C., over dinner before he had spoken with Nadler. It's all setting up a major confrontation next week if the Justice Department doesn't send the full Mueller report to Congress by Tuesday, as six committee chairmen have demanded. The next step, the staffers said, would be a subpoena. "We'll have more to say on April 3," one staffer said. Democrats are also fleshing out the legal and political arguments they'll make next week if the Justice Department does refuse to release the report. They'll insist there's no reason the president could not be charged with obstructing the investigation — making the point that Deputy Attorney General Rod Rosenstein repeatedly charged defendants with obstruction even if he didn't charge them with an underlying crime. And they'll also focus on the counterintelligence aspects of the investigation — including looking beyond the narrow scope of Russia contacts outlined in Mueller's letter. House Intelligence Committee Chairman Rep. Adam Schiff, D-Calif.., announced in February that he was relaunching the panel's Russia investigation but expanding it to include whether Moscow or other foreign actors possessed financial leverage over the president and his allies. Schiff reiterated the importance of investigating that question Thursday even as he faced new calls from the committee's GOP members to resign. Nadler, too, has committed to a sweeping investigation of the president's conduct, including whether he obstructed justice. He has called for Barr to appear before the committee to address the conclusion of the Mueller investigation. The New York Democrat has promised to consult with his Republican counterpart before issuing any subpoenas, and to hold a full committee vote if the two disagree on issuing any. That means the earliest any subpoenas would be issued would likely be weeks, not days. The Democratic staffers reiterated that there is ample precedent for Congress obtaining the kind of information they are seeking — pointing to what the Justice Department turned over to GOP-led committees in the last Congress as they investigated how federal law enforcement handled both the Hillary Clinton email investigation and the circumstances that led the FBI to initiate a counterintelligence investigation of the Trump campaign.